Jurgen Klopp was in fine form today during the pre-Crystal Palace press-conference held at Melwood. This time, the Belgian will be up against us, and he was the subject of many questions delivered at Liverpool’s manager. 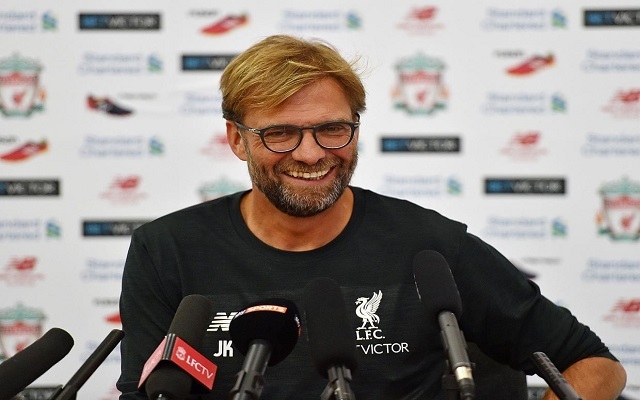 Klopp also discussed the potential joining of the first-team and Academy training facilities, Liverpool’s feel-good factor and the health of James Milner and Joe Gomez. It’s as of yet uncertain if our starting left-back will be available or if Alberto Moreno will cover him in defence. Liverpool need a win to stay level at the top of the table, although if other results go our way, we could be outright Premier League leaders by the time the weekend’s over. It’s no surprise. We knew about his qualities. Every player needs the space to develop and show things. We couldn’t change it and I’m pretty sure Christian thought the same, so it made sense to make the transfer. We know him best as we had him all the time in training. He always showed his quality in the area where he is really strong. He’s not only good at heading but he is especially good at heading. When we know what we’re going to do, we’ll tell you. It’s about looking for improvement. We need to develop a lot of things. We’re building a new stand, we’re thinking about bringing the Academy and Melwood together. We want to have the best circumstances the first team, U23, youth team. But when we know what we’re going to do, we’ll tell you. I wasn’t surprised by performance (v Spurs). My selection isn’t more difficult than before the game. They played how I expected them to play. I have the same decision to make like before the Tottenham game. Is it allowed for me to say I like Alex Ferguson? I met him before I was Liverpool manager. Nice for him to say something positive.I knew him before and he did what he had to do at Manchester, which automatically isn’t good for Liverpool. But it’s better he says something positive than negative about Liverpool. I’m sure he didn’t go out of his house and think ‘I’ll say some things about Liverpool’, he was asked a question! We have a few knocks. Millie (James Milner) was ill on Tuesday. Yesterday he did a running session. We will see how he is today. Yesterday he had a running session. We have another two days. He had no chance on Tuesday. But apart from some knocks in the game, we are okay. During the international break we will have a game and he will play some minutes. Joe looks really good at the moment but he was a long time injured and it’s a long way back. There’s no rushing. Thank God that we don’t have to put pressure on him because we need him tomorrow or something. He’s still a young boy and we will give him the time to come back in the right moment. He looks good, he feels good. He is tired a lot after sessions, but that’s normal. Palace are a good team and very experienced in defence with high-quality offence.They have made good signings in the summer and in my opinion they can aim for Europe. They’re a really good team. I hadn’t played too often at Palace, just the one time that we won. It’s a difficult place to play, small, atmosphere. We are looking forward to it. We have to prove we want to stay on track. One reason for football is we can win together, we can lose sometimes together, but you can always have an optimistic view. Maybe we had to change the minds of fans about the past, but while I don’t know too much about enthusiasm I feel there is a positive atmosphere in and around Melwood at moment. That’s good. It’s not cool when you always think about football that you’re 20% more upset, you should be feeling better. That’s our job to do. Until now it’s worked somehow. It’s really, really intense even when football isn’t the most important thing.